“Kiev is attempting to blow up a chemical plant that will destroy a 600 KM diameter/ 300KM radius of area — every living thing. The object of the Ukrainian Government’s campaign is to produce as many residents there fleeing into Russia as possible, so that the voting-base that had elected the pro-Russian Ukrainian President whom Obama overthrew in February, Viktor Yanukovych, will no longer be Ukrainian voters. 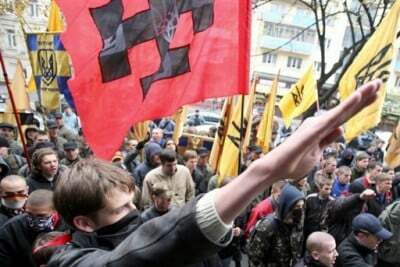 The pro-Hitler portion of Ukraine during World War II was the country’s northwest. Ukraine’s southeast tended to prefer Stalin’s rule instead. After the end of communism, the southeast sought closer ties to Russia, whereas the northwest sought closer ties to “the West,” but came to be led actually by CIA-backed admirers of the pro-Hitler Ukrainian Stepan Bandera, whom Hitler’s forces imprisoned when it became clear that Bandera sought to establish a pro-Nazi independent Ukraine, and Hitler’s forces insisted instead on Ukraine’s total subjugation. When Obama took over Ukraine in the February 2014 coup, his agent Victoria Nuland placed at the top of the new Ukrainian Government the leaders of Ukraine’s two nazi (or “pro-Nazi”) Parties, Right Sector, and “Freedom” or Svoboda (formerly called the Social Nationalists, but the CIA instructed them to change that name), both being led by Yulia Tymoshenko’s ally Arseniy Yatsenyuk. The exterminations of the residents in the southeast started on May 2nd and are continuing. Obama’s people call the residents there “terrorists,” because those residents overwhelmingly oppose the Obama-installed leaders and seek to establish their own autonomous republics instead, or else to become part of Russia; but, in any case, not to be ruled by Obama’s Ukrainian regime.